UPDATE: Vodafone has confirmed terms and conditions. The deal also applies to the Lumia 625 and Lumia 920 handsets purchases, but they'll only get buyers 6 months of Netflix. The offer runs until 31/12. Nokia has reached a deal with video streaming giant Netflix to offer a free annual subscription to anyone who snaps up the flagship Lumia 1020 handset, according to reports. The Financial Times said that buyers will need to obtain the device from Vodafone in order to take advantage of the offer, which will apparently be promoted heavily in the weeks to come. Nokia is looking to build on its slowly-but-surely increasing slice of the mobile market in the UK as shareholders ponder the sale of its devices and services business to Microsoft. Vodafone is no stranger to this sort of promotion. In a bid to boost the uptake of its new 4G LTE network, the company is offering free subscriptions to either Sky Sports Mobile TV or Spotify Premium. So, those who grab themselves a Lumia 1020 on a 4G contract in the next few months will have a formidable digital content locker to enjoy, at no extra cost. The Lumia 1020, launched in the UK last month, offers an interesting proposition for keen mobile photographers, thanks to its PureView 41-megapixel camera. 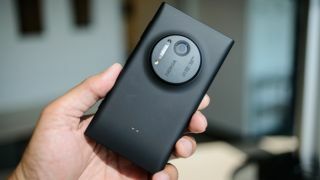 Despite the high-end imaging tech, it also manages to maintain a relatively slim profile (unlike rivals like the Samsung Galaxy S4 Zoom) and the latest Windows Phone 8 operating system. Would you be willing to trade the inferior Windows Phone app ecosystem for gratis, all-you-can-eat Netflix? Let us know your thoughts in the comments section below. In depth: Can the Lumia 1020 really take on a compact camera system?